Students of the history of the sport will know that the Wembley Lions were once the nation's most successful and glamorous speedway club. Their complete story is told in a new book - "When the Lions Roared". Author Peter Lush has teamed up with veteran writer John Chaplin to recount the history of the club from pre-war times right through to their final meeting in 1971. Lush was a fan during the Lions' final fling in the early seventies, so relies on Chaplin and contemporary publications to flesh out the details of their earlier existence. Chaplin has written the chapters on the Pre-war history of the club, leveraging previous articles he has written on the subject. This section of the book is fairly brief, offering a high-level overview of the 1929 to 1939 seasons. We get much more detail on the action on the resumption of racing after Hitler had been defeated. There are individual chapters on each of the seasons between 1946 and 1956, along with other chapters covering different aspects of the club's history. The story is told largely in chronological order, detailing the events as they unfolded throughout the season. A lot of the narrative is based on the reports that appeared in the programmes, books, newspapers and magazines of the time. Lush combines these with his own knowledge of the sport and the benefit of hindsight to tell the tale in a straightforward and entertaining style. These years were remarkably trophy-laden, so there's no shortage of things to discuss. In addition to seven league titles, the Lions chalked up a couple of National Trophy wins and almost monopolised the London Cup. All good things must come to an end, and so it was for the Lions. Between 1957 and 1969 the Lions fans were deprived of seeing their team in action. The commercial realities of the time and more lucrative uses being found for the stadium seemingly behind the closure. The tone changes slightly when we reach the Wembley revival in 1970. The author is able to call on his own first-hand experience of the times and there's a more personal touch to the writing. 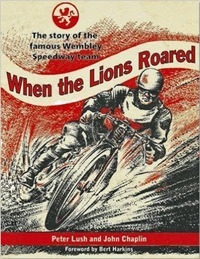 Wembley Stadium was also the home of the World Final for many years, while that's touched upon, this book is very much a history of the Wembley Lions, rather than of the other speedway held under the twin towers. In addition to Lush and Chaplin, four others have made valuable contributions to the book. Matt Jackson (from Speedway A-Z) has contributed marvelous profiles of the Wembley riders and lots of interesting statistics. John Somerville has opened his archives and allowed the publishers to include many great pictures. Bert Harkins, a very popular Wembley Lion indeed, has written the foreword. Finally, Mark Lewisohn (the only full-time Beatles historian) has contributed a chapter on his own memories of the 1970/71 era. There's a real collaborative feel to this endeavor and it's all the better for the contributions these other individuals have made. This is a comprehensive history of one of speedway's greatest teams, which has never been told in quite this way before. There's plenty of reading here and also more than enough results and statistics to ensure this also works as a reference book. The book can be ordered from the London League Publications Ltd website, www.llpshop.co.uk for £14.50 post free in the UK. It is available on Amazon and can be ordered from all good bookshops.